1 of 2 In a small bowl, stir together ranch dressing, vinegar, sugar and black pepper; set aside. 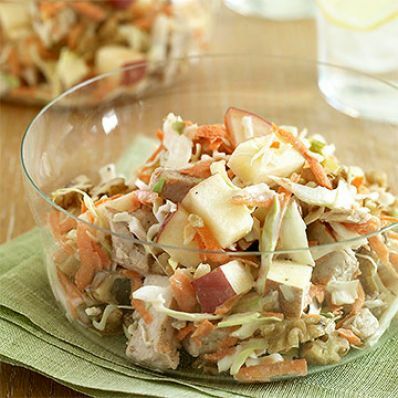 2 of 2 Combine cole slaw mix, carrots, turkey, apple and walnuts in a large bowl. Drizzle salad dressing mixture over top and toss well to combine. Refrigerate at least 1 hour before serving. Per Serving: 15 g pro., 24 g carb., 14 g Fat, total, 38 mg chol., 2 g sat. fat, 5 g fiber, 615 mg sodium, 268 kcal cal.